Like 6-from-59 style lottos like the UK lotto? Our exclusive UK Lotto Plus game gives you the SAME format as the UK Lotto draw on exactly the SAME days, but with a big difference – we’ll top up the jackpot with FIVE MILLION pounds sterling! Am I betting on the UK National Lottery Lotto? No. Absolutely not. For regulatory reasons, as of 8th March 2018 we cannot offer you a bet on the UK National Lottery Lotto. However, because we believe strongly in giving our customers innovation, better products and choice, we thought we'd take 6 numbers from the Swiss Loto Express. Choose 6 numbers from 1-59 or select the QuickPick option (Quick+1) and this will automatically choose a line for you. Once you have chosen your numbers, select which draw you want to bet on (Wednesday or Saturday) and press Submit. This will take you through to a checkout. Be sure to review your purchase first then click Confirm and proceed to place your bet. In each draw six numbers are drawn. Players who match all six numbers will win the jackpot. A further bonus number is drawn out after the six main numbers. This affects players who have 5 matching numbers. If their sixth number is the same as the bonus ball they will hit the second prize division. The results for UK Lotto Plus are selected from the Swiss Loto Express keno game that is an official game of the Swiss National Lottery. We take the first 6 numbers drawn between 1 and 59 from the 9:40 PM draw and the results can be found here. Because the Swiss Loto Express is a 1 to 80 lottery game, there is a small chance we will not be all able to determine all 6 numbers in the first draw. In this instance, any numbers yet to be determined will be derived from the following subsequent draws which happen every 5 minutes between 4 am and 10 pm. • You pick the numbers 5, 39, 4, 44, 1 and 11. • In the 9:40pm GMT Swiss Loto Express draw, the following three numbers 5, 25, 39 (only those 59 or under) are selected. • The remaining three main numbers are selected from the 9:45 pm draw that is 2, 11 and 58. The bonus ball is also selected in this draw, say 41. • The winning numbers for will therefore be 5, 25, 39, 2, 11 and 58, plus the bonus ball is 41. 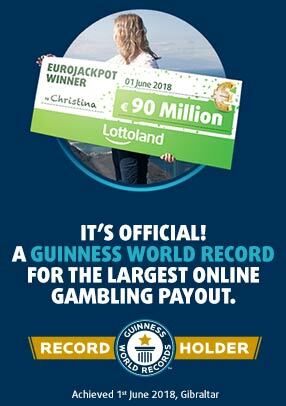 • You therefore match three numbers (5, 39 and 11) so, congrats, you could win an estimated amount of €28.59! A single line bet costs €3. The draw takes place from 9:40pm GMT on Wednesdays and Saturdays and you can place bets until 9.25pm GMT on both days. Our exclusive UK Lotto Plus game always matches the UK National Lottery Lotto’s jackpot, then tops it up with an additional five million pounds sterling! When the National Lottery's Lotto jackpot hits £22 million and still doesn't have a winner, it rolls over to the next draw one more time. In the past, this final "must-win" jackpot has reached over £25 million. With our £5 million boost, that means you could potentially win a jackpot as high as €35 million! The DoubleJackpot feature allows you to bet for twice the lottery jackpot. So, for instance, if the top tier is £15 MILLION and you activate the DoubleJackpot feature, you can potentially win £30 MILLION. You will pay double the price of your normal line bet to activate the DoubleJackpot feature. Will I have to share the jackpot? While UK Lotto Plus is completely separate and distinctive from the Swiss Loto Express and the UK National Lottery Lotto, by betting with us, you win the amount that you would have won if the Lottoland advertised UK Lotto Plus jackpot was shared between you and any official lottery winners of the National Lottery Lotto game, or other Lottoland winning players. Don’t feel like sharing the jackpot? No problem, just select our exclusive NumberShield feature to bag the full jackpot value. For just €1.50 a bet, you can shield your lucky numbers and grab the entire jackpot for yourself, regardless of how many other Lottolanders have matched the winning numbers. The odds of winning the jackpot are 1 in 45,057,474. A breakdown of all the odds for each prize tier, together with estimated returns is included below the next answer. Our JackpotHunt feature allows you to decide how big a jackpot you want to go for. So, for instance, if you only want to go for a jackpot when it is over €15 million, simply set your participation level to €15 million and when the jackpot reaches that figure you will start participating. You will continue to participate until the jackpot drops below the £15 million figure. The JackpotHunt feature is open ended and will run for as long as you want it too. You can opt out at any time. Does UK Lotto Plus have a “roll down”? Unlike the National Lottery Lotto, we do not “roll down” the jackpot prize fund to the lower prize tiers after 5 rollovers. However, our jackpot comes with a whoppin’ FIVE MILLION pounds sterling! – that means bigger winnings when you strike it lucky. Why should I play UK Lotto Plus? Our exclusive UK Lotto Plus game gives you the SAME format as the UK Lotto draw on exactly the SAME days, but with a big difference – we’ll top up the jackpot with FIVE MILLION pounds sterling!